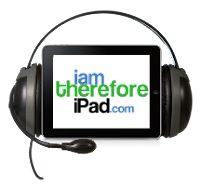 I am Therefore iPad: iAmThereforeiPad Podcast #4 - Cable Channel Streaming, Apple and eBay wins iPad 2, Scalpers sell WWDC Tickets and more. iAmThereforeiPad Podcast #4 - Cable Channel Streaming, Apple and eBay wins iPad 2, Scalpers sell WWDC Tickets and more. iAmThereforeiPad.com is an online community that offers valuable information that allows you to make intelligent decisions towards the purchase of or use of your iPad device. They offer daily news, reviews, software downloads, polls, iPad hardware and iPad accessories. It is a valuable resource for any iPad or iOS device owner. In the iAmThereforeiPad Podcast #4, Carl W. Brooks talks about the Cable companies and their Streaming Content, Apple and Scalpers hit it big for WWDC, How to Protect and Share your iPad, Apple is Running out of iPad 1 and iPad 2 sells big on eBay, iPad Tablets in Schools, President Obama owns an iPad and Apple turns 35 all on this week's episode of the iAmThereforeiPad podcast. Before you Buy AppleCare for your iPad - Read this!